Live in the UK and want the joy and glamor of the Turducken without the hassle? Well for a cool Â£665 (US$990) Heal Farm will gather up 12 different birds, pluck, debone, and build them into one of the biggest roast dinners you've ever seen. The True Love Roast has a bird for each of the 12 days of Christmas. ... on the 13th day of Christmas, Heal Farms gave to me.... Triple bypass surgereeeeeeeeey.... Genius! The most outrageous multi-bird we have created yet! Made with the meat from 12 different types of bird, both land and water fowl. There is breast meat from 48 birds with 8 different types of stuffing. The True Love Roast has a bird for each of the 12 days of Christmas. Goose filled with orange and walnut stuffing. Chicken with hazelnut and ginger. Aylesbury duck with sage and onion. Barbary duck with Persian fruit stuffing. Poussin and guinea fowl layered with parsley, lemon and thyme. 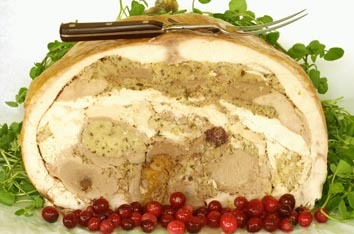 Partridge and pigeon squab set in juniper stuffing. whole boned quail filled with cranberry and orange relish. a roasting thermometer so that you can see when it is cooked. Some vital statistics- The True Love Roast weighs 25kgs. yields around 4 litres of flavoursome stock. Oh yes - and it does take two people to lift it!